Each one of us loves the ease and convenience that digital marketing offers. We often tend to ignore the efforts that businesses and their teams are putting in. One of the most formidable challenges in the field of digital marketing, for companies and their marketers, is to maintain the pace with the speed of advancements launched. Just give it a thought that if the busy marketing teams won’t be able to catch up and miss things due to their involvement in routine activities – how unpleasant would it be for the people who don’t belong to this industry? If you are also a marketer, you might be facing the same issues. The visitors or end-readers could sympathize with you, but that doesn’t strictly implies they will stop nagging about the significance of surviving through the constraints of time to stay ahead of rise and falls of digital marketing. Not just a single trick or strategy, staying up-to-date with digital trends and unbeatable practices are the actual driving forces for successful, long-term campaigns of marketing. We all know that the Internet is an aesthetic space where images, graphics and videos play a prominent role in the stories that marketers and companies narrate. But as the accessibility of web design among masses has increased at a progressive rate, it is changing at a faster pace. Everyone today has become familiar with the trend of long scrolling; credit goes to the mobile devices. This technique is working really well for the websites that want to win over the users through the medium of storytelling. Moreover, you can try breaking that scroll into sections. So, all the sites that are using sliders should pull up their socks. Even statistics have a clear intimation for them. It has been observed that only 1% of the website visitors stumbled upon a five-feature slider and among them, 89% population proceeded to click on the first image. The use of sliders was introduced to induce clicks on the most significant features of your site, but they didn’t work out. So, it’s time for a change and implements new designing features that are simple-to-use. As the adage goes – ‘Content is King’. 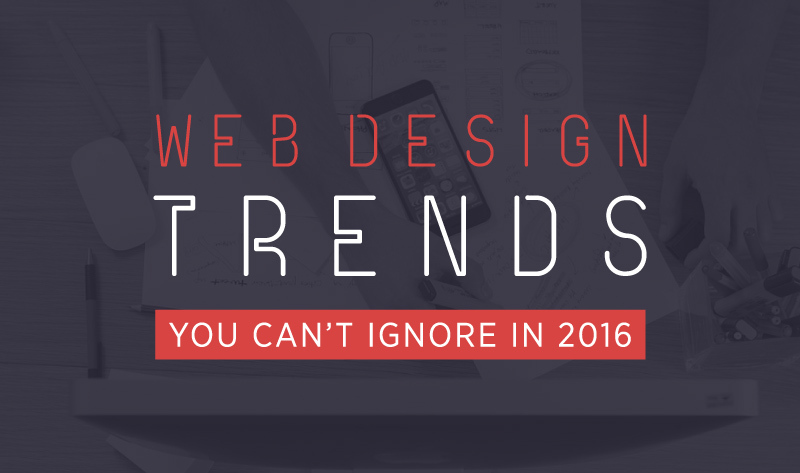 It is actually the most influential factor for the success of your web design. In a recent survey, 45% of the marketing professionals’ written content makes the most of the influence. But there are still many designers who work with dummy content. This is simply not good to go. You should design and write the content side-by-side. Having appropriate content in hands will help you get the right design and you will end up producing a finely-done website. It’s quite simple to get stock images. It is their obviousness that makes them unable to shift the needle as much as the customized images do. There are a plethora of tools available in the market that makes creating customized images easier. Even stats justify the usage of custom images – 46% of marketers agree that customized photography has become an inevitable part of marketing strategies. Due to the extended accessibility of the stock photos, the ability to custom images to improve engagement has gone more profound while making sites more resourceful. It would be a favor for your own self to quit using stock images or, at least, modifying them a little. It’s really worth making some extra effort to get noticed by the maximum potential audience. No one today is patient enough to wait for a long time just for a website to load. A way too slow website makes browsing an irritating experience. From the statistical point of view, 40% of the people simply abandon the web page if its loading time exceeds three seconds. This is often a reason why sliders are losing their hold. No longer is the time when you can get the required results with merely fresh content pieces and an active presence in social media channels. Today, you need to identify the perfect medley of marketing tricks so to get success. In fact, 65% of the marketing professionals believe that visually rich content comprising photos, illustrations, videos and Infographics could help brands to tell their story in an effective manner. All this might sound like a lot’s of work, but you will realize the worth of putting so many efforts once you will gain a remarkable recognition in the digital world. Kristy Bernales is working as a full-time designing professional with Melbourne Web Design Xperts Company. Each blog of hers is a great source of information for both newbies as well as experienced designing professionals. Work feels no less than a pleasure when she is tuned in with her favorite tracks.